Today there was a very early morning light rain, followed by fog—a mostly gray, dreary but mild day. The clouds lifted a short time before sunset and the sky colored a bright clear blue, before mixing with apricot, red and orange hues. 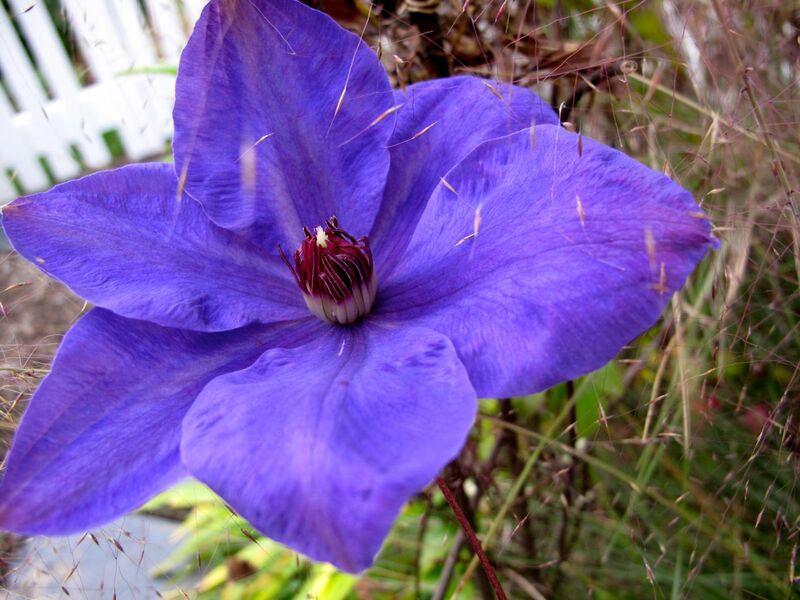 In September I had expected the Jackmanii Clematis to flower again but it did not. Today I found one perfect flower under the shelter of neighboring Muhlenbergia capillaris (Pink Muhly Grass). 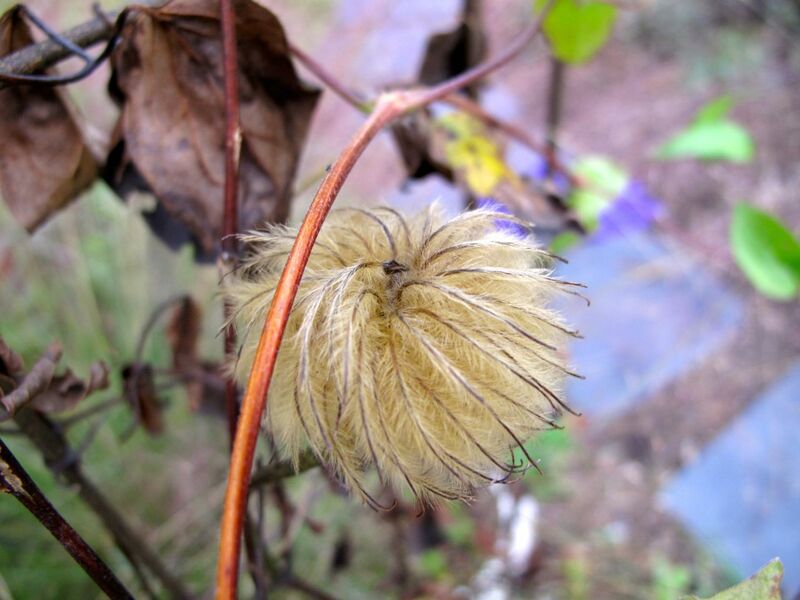 This Clematis has interesting seed heads also. 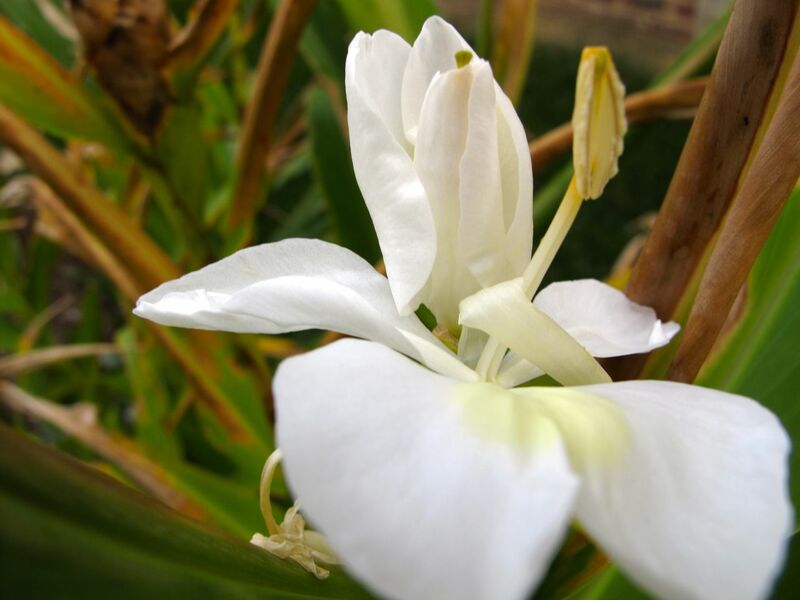 Surprisingly the Ginger Lily still has several blooms even after the October frost. The leaves and stalks are turning brown. A nice surprise during this garden wander was finding that rich orange hips have formed on Gardenia jasminoides ‘Chuck Hayes’ along the western border. 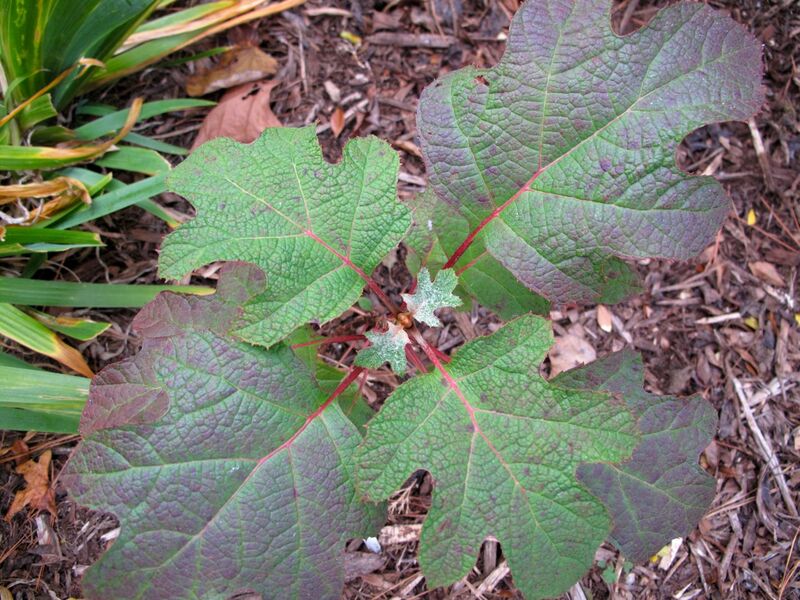 One last image for today is that of the Hydrangea quercifolia ‘Ruby Slippers’ I planted in April. This is a dwarf variety and maybe has managed to reach about 12 inches. It was touted as having nice fall foliage and it is beginning to display red stems and burgundy tinges on the leaves. This entry was posted in garden and tagged Camellia sasanqua, clematis jackmanii, garden almanac, garden photography, Gardenia jasminoides 'Chuck Hayes', German Bearded Iris, ginger lily, Hydrangea quercifolia 'Ruby Slippers', nature photography, yuletide sasanqua on November 7, 2013 by pbmgarden. Nice! grow alot of bearded iris too, your flowers are lovely. My favorite flower is the Gardenia, love the fragrance. Our oak leaf hydrangea have already lost all their leaves. We seem to have lots of plants in common Michael. This oak leaf hydrangea is very sheltered so maybe that has made it change more slowly. It’s new this year. I think your lovely iris is called ‘Immortality’. 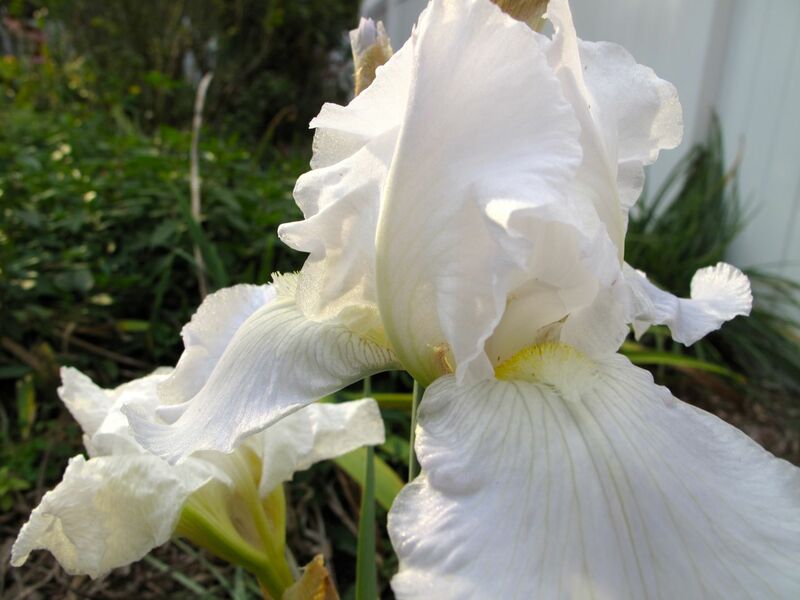 From my limited knowledge of iris, it is the only white re-blooming iris. 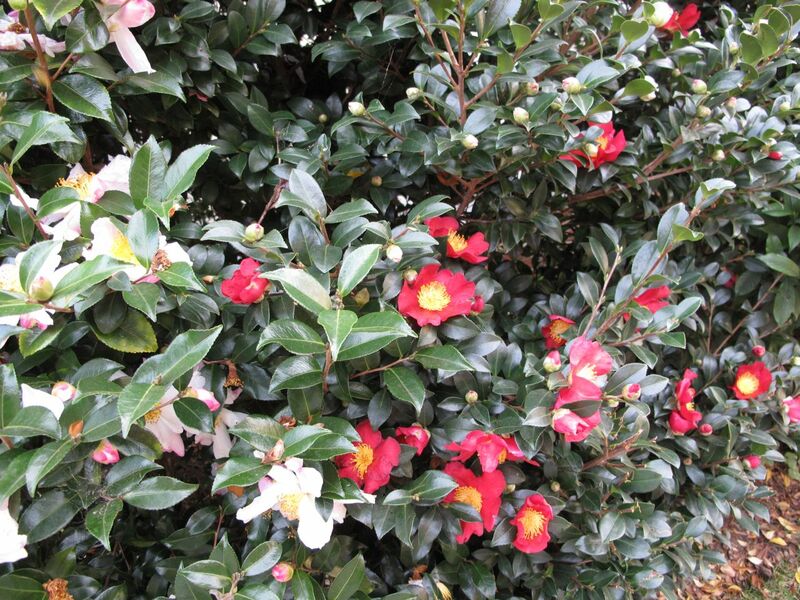 Your camellias are so beautiful and they seem to bloom forever. Is it easy to grow? P&B, once again you’ve come through helping me with identification–really appreciate knowing the name of that iris. Glad you like the camellias. They are maintenance free once established, have a long bloom time and in this area, if you plant different varieties you can have them blooming most of the year. I hope to add some more. Thank you for your advice. I may try growing them next year since they are ‘maintenance free’. I had no idea gardenias had red hips like that! Hi Cindy. 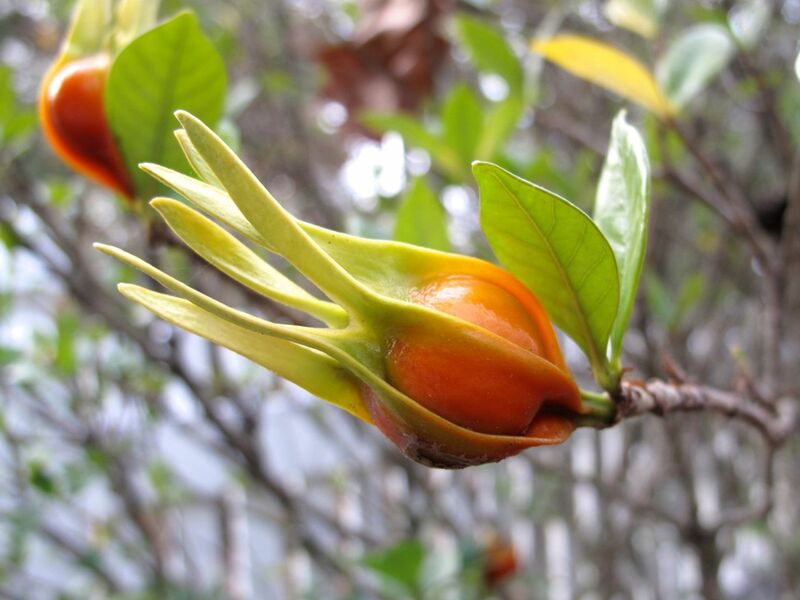 Years ago, the first time I found the (more orangey) gardenia hips, there were not many and they were on a different kind of gardenia. I thought the plant was diseased! This year the Chuck Hayes variety has numerous hips. 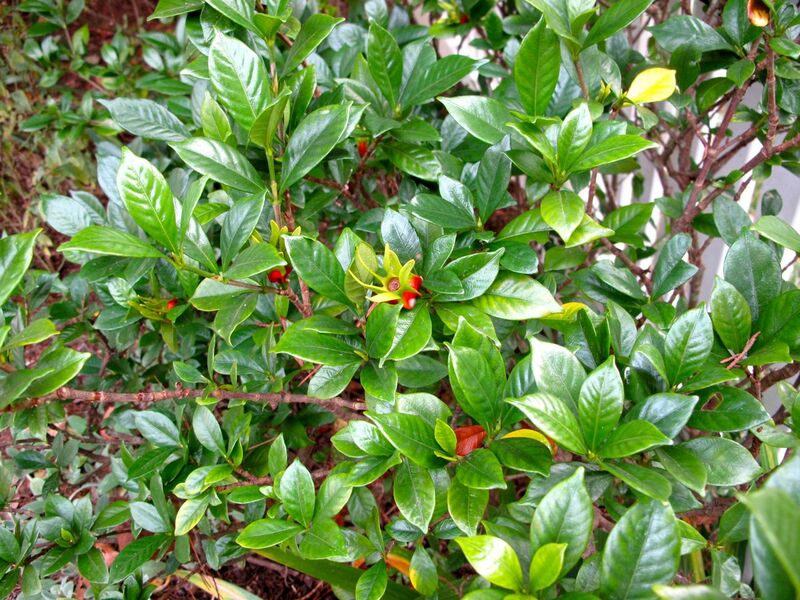 The gardenias on which I had first seen hips do not (so far) have any. The hips on your gardenia are stunning, such a lovely shape too. You have a lovely selection of flowers out now with your re- blooming iris and camellias, they must make your garden very spring like! I was excited to find the gardenia hips yesterday Pauline. It’s nice to have flowers around. As soon as the sun comes up, I’m going out to see if my gardenia has hips. I don’t think it does. Rats. Will have to remember ‘Chuck Hayes’. Marian, hope you find some! I have an unknown type of gardenia also and it has had hips previously but not so far this year. They’re more plentiful on the Chuck Hayes this year than I’ve ever seen. Judy, I can relate! There is something about an iris. 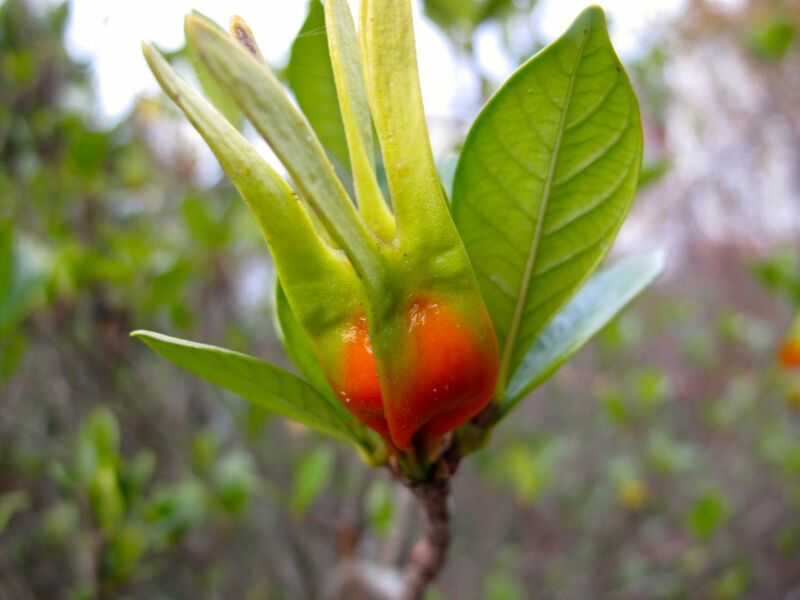 I have never seen Gardenia Hips before, they are beautiful, such an interesting form. As to your Iris – I can only say I wish mine were reflowering, yours are soooooooooooo beautiful. The Gardenia hips are a real treat. Perfect color for fall. I know we share an admiration for Irises. 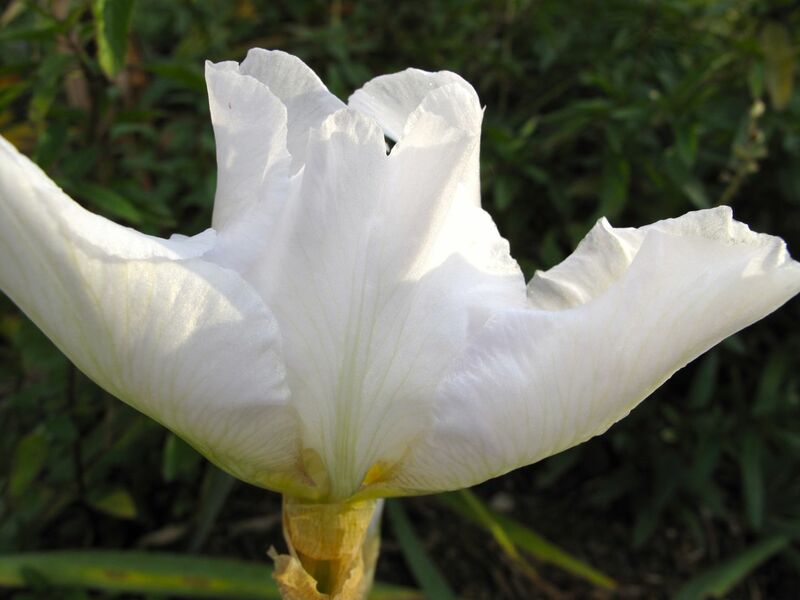 A reader (P&B) says she thinks this is called ‘Immortality’ –the only reblooming white Iris. That Ruby Slippers is going to be gorgeous when it gets big. And you have so many lovely camelias. Thanks! I am so looking forward to seeing flowers on the Ruby Slippers, but for now I must be content with the foliage color. I can see from the comments that I’m not the only one stunned by those gorgeous gardenia hips! 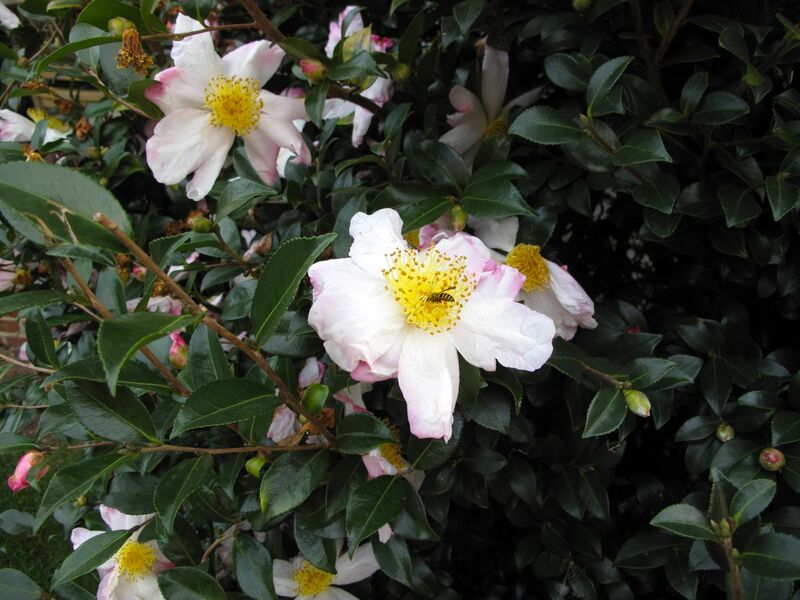 And the camellias are looking so good already – lovely! Glad you like the gardenia hips Cathy! They are a bit unexpected, which is nice to encounter this time of year. 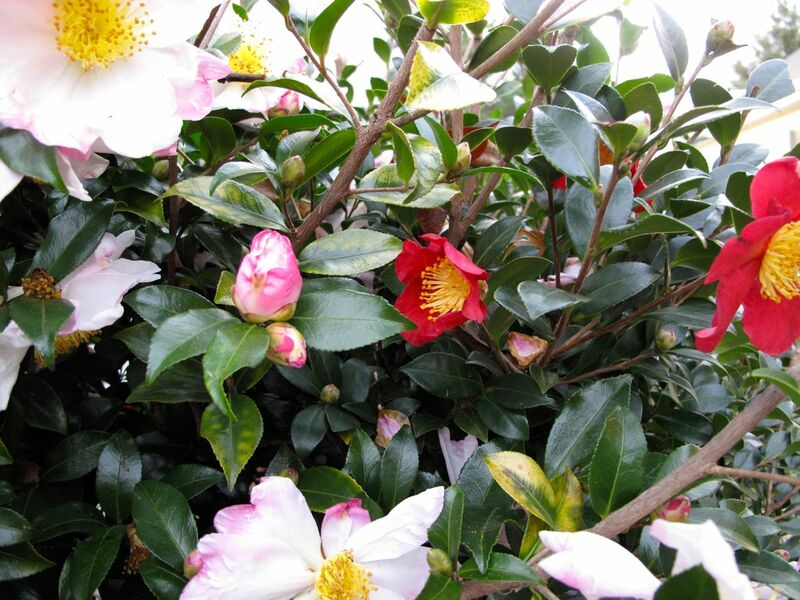 The camellias require so little but bring a lot of pleasure. Enjoy your weekend. Gorgeous, absolutely gorgeous; it was so enjoyable to see what you have still blooming. Glad to share it with you Charlie. A frost last night nipped those irises but if it warms there may be several more blooms. 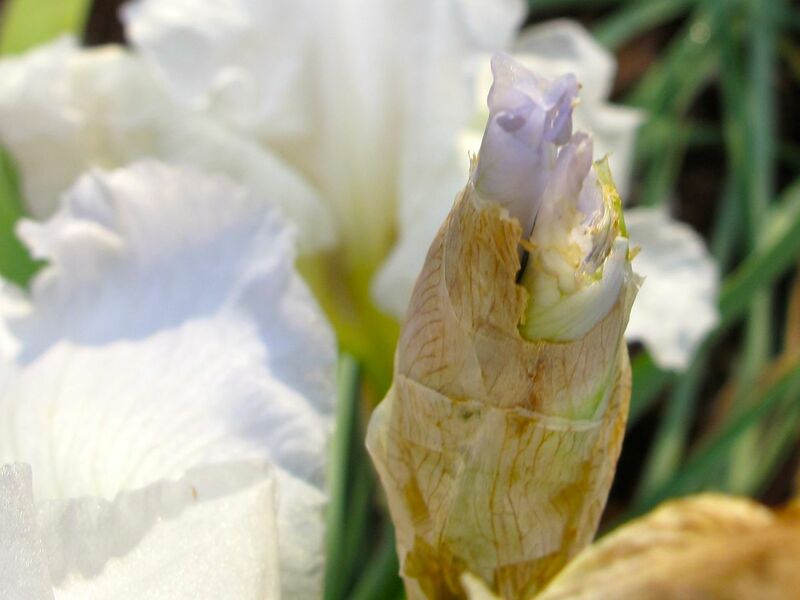 I love the reblooming irises…my season is too short to have them rebloom. What a treat to see all the flowers and foliage again!! Glad you enjoyed the flowers and foliage. We had frost yesterday morning but today it’s 74 degrees. So we are getting a taste of the cold weather. The irises didn’t like the frost but some buds still may open. 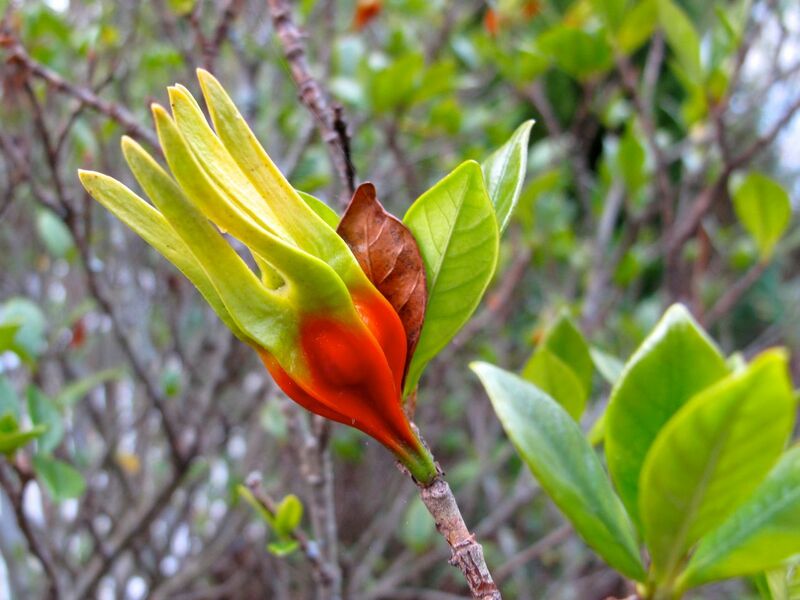 Love the camellias and add me to the list of people fascinated by the gardenia hips….. very cool. Hope everything is still holding up well after the last cold snap. Thanks. The camellias have been especially nice this year. Makes me want to add more. The gardenia hips are a bit of fun. 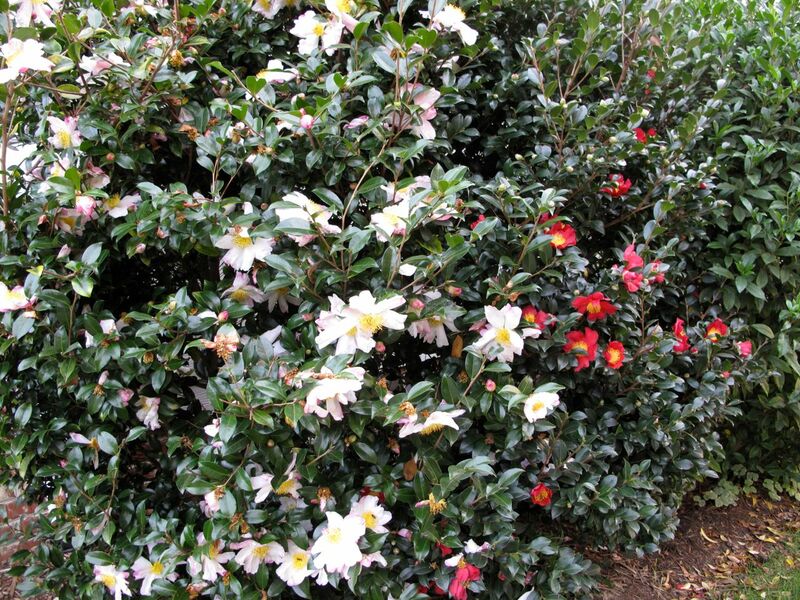 Your camellias are spectacular. I wish I could grow Yuletide but it isn’t hardy here. My Immortality is a very sporadic rebloomer, only one stalk with one flower this year. You had no choice but to bring it home! Wonderful. Thanks for letting me know. I looked up ‘Versicolor’ and it is lovely. Hope you will get much pleasure from it Annette.